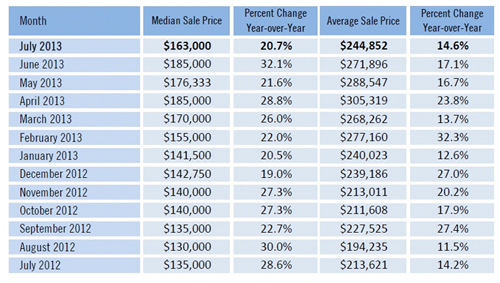 Home » What Price Ranges are Hot? Last week we reported that home prices were down the past few months but not to get too concerned as they were expected. This week we provide a graph that illustrate median home prices and average mean home prices so you can see what we’re talking about. What Price Ranges are Hot? It’s not unusual for prices to retreat after the season, so we look at year over year prices out of season and we see prices are still up over last year by the same percentages as they were in season, so we’re fine. Now let’s delve into which price ranges are hot. As you can see from the price range chart, the $400,000 $599,999 range is the hottest with a 82.5% gain. This is not only true for the July 2013 data but also many months prior, so we can definitely say the $400-600k range is doing well. Really all the price ranges except for maybe the $300,000-$399,999 range is doing particularly well. This could be for the same reasons the less than $100,000 range isn’t doing well. 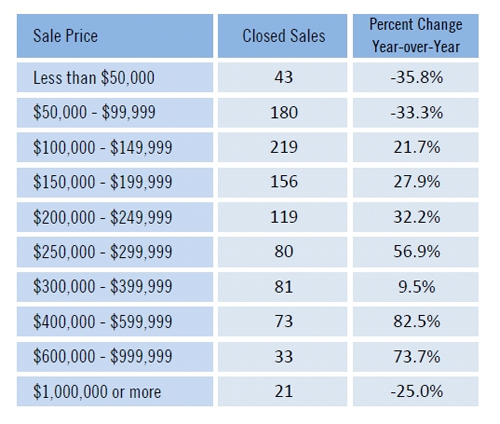 We have little to no inventory anymore at the lower price range. They’ve graduated up, so those same sales are occurring in the higher ranges. It’s entirely possible many of the $300k+ range homes have graduated into the $400k= range and thus more homes are selling in that range. I tend to think some of that is possible, but more likely we’re seeing strength at the bottom of the market and the upper middle of the market as those that can afford $400-600k either have local businesses on the mend in SW Florida or they are out of town buyers buying second home and retirement homes. We are also seeing some relocations coming into the market and buying property, although companies like Hertz are recognizing that fewer existing employees took the relocation offer and instead their recruiting and hiring more outside employees to take jobs here in SW Florida. Hertz will hire some locally, however many are coming here and being recruited from other companies with certain specialty education and job history in the field. It doesn’t really change how many people Hertz brings in but it does change from where they bring them. Less of these employees coming to Hertz are actually from Hertz. Last November we started seeing spikes in the average sale price in Lee County Florida and it wasn’t until February of 2013 before we saw significant price swings here in SW Florida, so we may have a few months more to go before we start seeing if a new price trend emerges for next year. Inventory is still tight, so with any economic luck we’ll be in for another good season, assuming we have enough inventory to sell this upcoming season. Feel free to search the MLS at TopAgent.com. Good luck and Happy House Hunting!!! Posted in Cape Coral, Cape Coral Real Estate, Fort Myers, Fort Myers Real Estate, Southwest Florida Real Estate.Tagged Cape Coral Florida home sales, Ellis Team Google+ Page, Fort Myers real estate sales, hertz, Hot price ranges, Lee County Florida, search MLS, SW Florida real estate, virtual tours, What Price Ranges are Hot.